You can add one or more languages to your account. 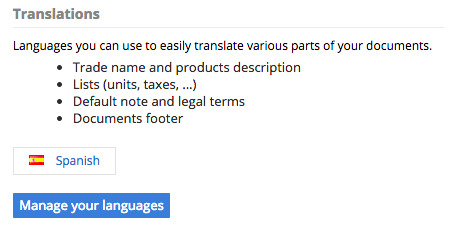 This allows you to send fully translated documents to your customers based on their language preference. Then click Manage your languages. In the next window, click Add and enter the name of the language. You can also choose a flag, which will be useful to visually identify languages in the interface. After clicking Save, the language is added to and will appear in the Translations section. You can add as many languages as needed.